Many gathered to listen and read about places and traditions from outside the U.S. from student to student. Everyone who walked passed the displays couldn’t help but to turn their heads, and many even stopped to check out various tables. The stories and props were filled with both radiant color and passionate history. Music from France, China, India, and a continuous wide variety of other countries were on the playlist for the event done by a live DJ. 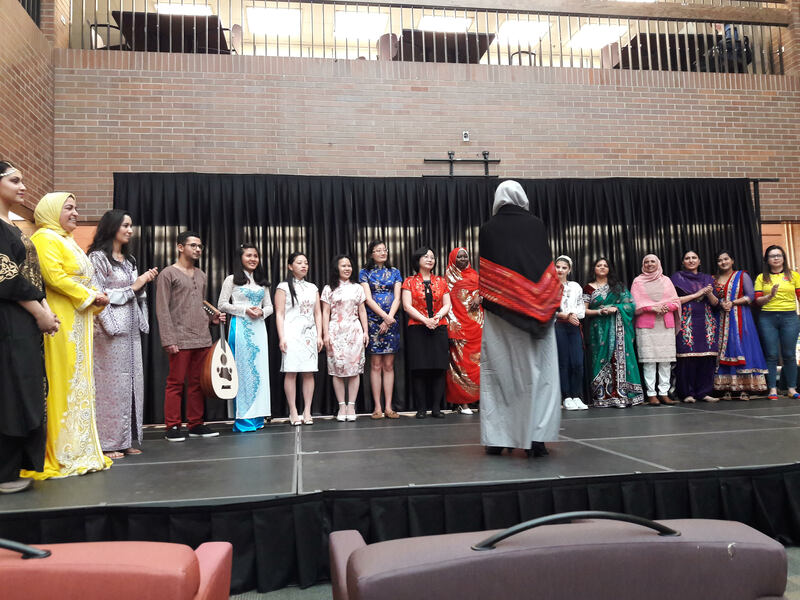 ESL (English as a Second Language) students were recognized early in the event as the winners of the project “My Journey to the U.S.” The project was available for ESL students to share their personal stories of leaving their home-land and how Tri-C was a part of their journey. Their projects also provided photos showing off their culture and photos in remembrance of family and friends overseas. The north galleria had a stage out for students to proudly display their traditional clothing from around the globe in runway fashion. The stage was also used for dancing, performances, and tutorials which encouraged everyone to rise from their seats. The event was free and welcomed everyone and anyone to join. Those who attended appeared to be having an enjoyable time, whilst learning the many cultures students at Tri-C Western Campus represent.